In the market for a new kitchen range? Luckily, you’ll have a range of choices! Actually, when you talk about power there are only two choices: gas or electric. 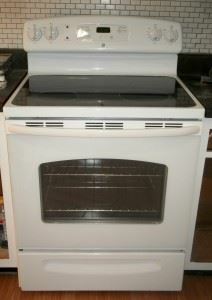 Put those two types of stoves side by side and you’ll see right away that the gas oven is going to cost you more. But, it’s going to cost less to operate. The average cost of running a gas stove is around 7 cents an hour while an electric over actually costs around 16 cents an hour. That might not seem like a lot for an hour of baking but add that up over several years and you can see where paying a little bit more for a gas oven will turn out to be more cost effective. How much more? If the average kitchen stove lasts around 15 years then it will cost you approximately $382 in gas versus $867 in electric power. Translation: What could you do with $500 extra dollars in your pocket? After you’ve settled on the type of range you’ll also get to pick the type of controls. Touchpads will provide you with more precise settings but they can be a big hassle to repair if they should ever break down. With a knob, all you have to do is swap out the knob. On a range top gas oven you’ll be dealing with open flames. If you go electric you can have either coils or a close top. Guess which one is going to be easier to clean? Some oven designs allow for warming zones. On electric ranges these are areas on the stovetop that you can keep a pot warm without cooking in. In a gas range, there could be a drawer at the bottom of the oven which lets you do the same thing. The problem with the oven drawer is that it is sometimes hard to manage and can easily overheat with the oven going. You can see you’ll have a lot of options for your new stove. One area where you don’t need a lot of options is getting rid of the old stove. That’s because Junk King Colorado Springs is really the only call you should make. Junk King will provide you with a two-man crew and dolly capable of pulling out your stove and loading it on the back of their truck. That’s right; you also get a truck to fill up with whatever kind of junk you want to toss out. Start with the stove and end with cleaning out your entire garage. Tap into the power of Junk King Colorado Springs today! This entry was posted in Colorado Appliance Disposal, Colorado Junk Hauling, Colorado Junk Recycling, Old Stove removal and tagged Colarado Springs Stove Removal on April 29, 2013 by John Busby. Last updated August 2, 2017 .